Well, I managed two whole days without posting anything buggy but I couldn’t resist sharing this shot with you today. Bumble bees love the Bishop of Llandaff dahlias in my garden. And I love photographing them. 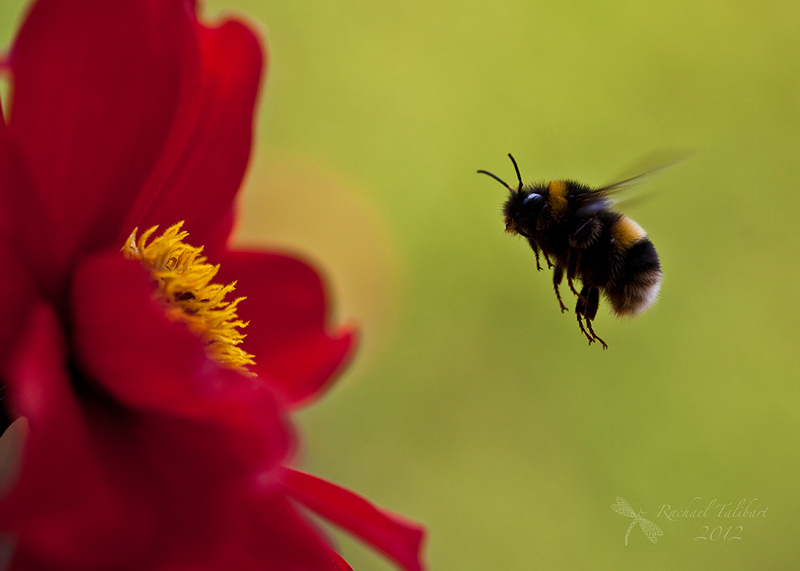 This entry was posted in garden, nature, photography and tagged bishop of llandaff, bumble bee, dahlia, flight, garden, insect, macro, nature, photograph, photography by Rachael. Bookmark the permalink. So… When can I have your camera? Hahaha. I love this picture and the quality is amazing for a picture of something that was FLYING… Well, I’ll make do with the camera I have now (My iPad 3, haha) 🙂 Thanks for sharing this photo, truly magnificent! yes I’ve heard that one Rachael.. it’s good isn’t it ! beautful bee I just love his legs! Nice ecclesiastical theme for a Sunday post. Love the bumble.